There is much controversy as to our Lord's temptations or testings. We maintain that our Lord could not sin, yet His temptations were real temptations. When even Satan tempts one to sin, there is a difference in the effect of such temptations on one (like us) with a sinful nature and on One with a holy, sinless nature and unable to be swayed by those temptations. In this case, the test would be passed without any question. Those external temptations only proved who the Lord was! Others maintain that unless He was able to sin, of falling to temptation, then the temptations were not real temptations. This is false reasoning because the Lord is assumed to be just like us, with a human nature able to commit sins. We will seek to present the truth of Scripture in this matter. We do not want to give the thought so prevalent today that our Lord was tempted within Himself and might have sinned, but did not. Scripture speaks of our Lord as fully Man, not with an innocent nature like Adam before his fall, but as having a holy nature. Yet, though sinless, He was tempted by outside tempters and thus endured real temptations or testings. We note that this edition uses the New King James Version, copyright 1982 byThomas Nelson, and is used with permission. Italics in the quotes have been added by the editors. Inmost places in Scripture, to tempt means simply to test, just as a person will put nitric acid on an ore sample to test for gold, for true gold is not affected by the acid. Tempt does not generally carry in its original idea the thought of outside evil producing a sinful response so that the person so tempted may fall victim to the outside temptation by sinning. We get the meaning of the word in its original sense in the commonly used word tempered. We speak of tempered steel-metal heated and cooled and coming out at the required strength, passing the test. Athletes run again and again in training so as to fit themselves for the hour of victory. There is no thought of evil in this, but the development of physical powers so as to pass the test. But the word temptation (Greek, peirasmos or peirazo, to try, to prove) has deteriorated in meaning. Generally today we think of it as consisting of an appeal from some outside evil source to a craving of our sinful nature, which, if responded to, is sin. Even to think about doing it is sin. One may consider some crime, but the chance of going to jail is too much risk to take, so the thought is put aside. The Lord would never have had such a thought. 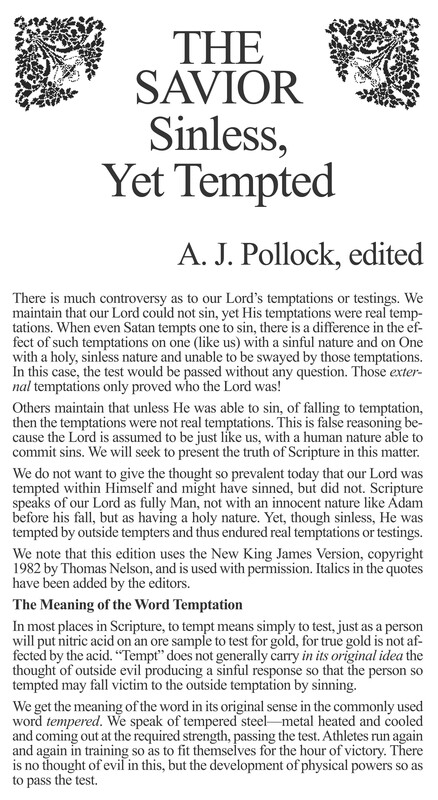 James used the word in the bad sense when he wrote, Let no one say when he is tempted, I am tempted by God'; for God cannot be tempted by evil, nor does He Himself tempt anyone. But each one is tempted when he is drawn away by his own desires and enticed. Then when desire has conceived, it gives birth to sin; and sin, when it is full grown, brings forth death (Jas.1:13-15). James says that God can never be tempted by evil. When God tested Abraham in offering his son Isaac, God was not tempting him with evil, for God had a right to ask what He asked. God is theGiver of life and He can demand back what He gives. Genesis 22:1 is the first mention in the Bible of the word tempt or test (Hebrew, nasah, to try, to prove). James uses peirazo in the sense of testing when he says, My brethren, count it all joy when you fall into various trials, knowing that the testing of your faith produces patience. But let patience have its perfect work, that you may be perfect and complete, lacking nothing (Jas.1:2-4). Again, Blessed is the man who endures temptation; for when he has been approved, he will receive the crown of life which the Lord has promised to those who love Him (Jas.1:12). These trials are from God to bring out character and powers suitable to Himself. We could not call ourselves happy when we fall into various trials if these meant an evil appeal from outside to our sinful nature, which if answered to,would be gratifying the sinful nature and would be the conception of lust or sin, ending in death. When we think of how God tested His servants to fit them for wonderful work for Him, we may well rejoice if such trials for such a purpose overtake us. There comes to mind Abraham mentioned above; Joseph and his 13 years of prison, fitting himat age 30 to take a position next to Pharaoh in Egypt; of Moses, 40 years at the backside of the desert, learning to be meek and patient so as to be qualified to lead the children of Israel out of Egypt; of David, hunted by Saul, being disciplined and fitted to rule over God's people; of Job, stripped and desolated, finding blessing; of Paul, three years inArabia, learning of God for his wonderful public career as a servant of the Lord. Our Lord Was Sinless in Thought and Action, Yet Endured Temptation. Two things are clear in Scripture: (1) Our Lord was sinless; (2) He endured temptation.To believe that our Lord could have sinned would be the denial of Scripture and the subversion of the foundations of the Christian faith. The temptation the Lord endured was never from within. Nature always expresses itself. If our Lord had committed only one sin- were it only a single foolish thought-it would prove a sinful nature. But a Christ with a sinful nature could be no Savior at all. He would need a Savior! We must take our stand there! The Lord said, The ruler of this world is coming, and he has nothing in Me (Jn.14:30).Not in the smallest degree was there with Him that which was vulnerable to Satan's attack.The angel Gabriel said to the virgin Mary, That Holy One who is to be born will be called the Son of God (Lk.1:35). Adam and our Lord were different. Adam was innocent-as created he knew the good and had no knowledge, till he fell, that such a thing as evil even existed. Our Lord was holy. He knew the good, He knew that evil in all its forms existed, but He practiced the good and was not touched at any point by the evil. He had no sinful nature inside to answer to evil outside. He was perfectly holy. (3) TheApostle John, In Him there is no sin (1 Jn.3:5). Note the context of these three verses. 2 Corinthians 5:21 says, He made Him who knew no sin to be sin for us, that we might become the righteousness of God in Him, thus showing the vital connection between our Lord's sinlessness and His ability to be the Sin Bearer. If our Lord could have sinned, He could not be our Savior. 1 Peter 2:21-22 says, Christ also suffered for us, leaving us an example, that you should follow His steps: who committed no sin, nor was deceit found in His mouth, thus setting before us the perfect sinless Example. 1 John 3:5 says, And you know that He was manifested to take away our sins, and in Him there is no sin or in Him sin (the sinful nature) is not, again showing the intimate and vital connection between our Lord's sinlessness and His ability to pay for our sins. It is like a stone arch. Take one stone away and it collapses. Take away our Lord's holy, sinless nature, not able to sin, and you lose the Savior, the gospel and all else worth having. We must remember that the Lord Jesus was the Eternal Son who became Man, never ceasing to be what He was from eternity. In becoming man He was God ...manifest in the flesh (1 Tim.3:16).How can anyone calling himself a Christian say that our Lord-God and Man in one blessed Person- was capable of sinning? May God forbid such blasphemy, for it is nothing short of that! Hebrews 4:15 says, For we do not have a High Priest who cannot sympathize with our weaknesses, but was in all points tempted (Greek, peirazo, to try, to prove) as we are, yet without sin. The Darby translation says sin apart. It does not mean that our Lord was tempted and could have sinned, yet did not sin. It means that sin does not come into the question at all, that His holy nature was perfectly free from all taint of sin. Notice how the positive truth is emphasized by being put in a negative form. Our Lord as High Priest on high is not One who cannot sympathize with our weaknesses, is the positive assurance that He is touched with the feeling of our infirmities and our weaknesses. Note that He does not sympathizewith our sins, but with our weaknesses. He mourns over man's sin. Christ also suffered once for sins, the Just for the unjust, that Hemight bring us to God (1 Pet.3:18). But infirmities or weaknesses are not sins. They are the result of sin-weakness, weariness, sorrow, isolation, hunger and thirst, which is natural to man's sinful condition. But our Lord in His perfect Manhood was sinless and had no sinful nature to appeal to, but in Divine sympathy went through circumstances, sin apart, and felt the sorrows and limitations His people experience in their present condition. What wonderful grace! Our temptations are sadly different! Take the case of a converted drunkard. As a Christian he meets temptation.The sight of a bar may start an inward craving for the excess which once marked him.The man of lust gets converted, but often there is the same inward response to sights and conditions that inflame him as in unconverted days. This is real temptation. We may well pray, Do not lead us into temptation, but deliver us from the evil one, or evil (Mt.6:13). The point of this prayer is that, knowing we have the sinful nature and the enemy ready to attack, not that we may not be tested or tempted, knowing that the test may involve a response from within, but that we may be delivered from the evil all around us. Again, Hebrews 4:15 does not say that our High Priest is not touched with the feeling of our sins, but of our weaknesses. Thank God, we have a Savior who was never touched with the feeling of our sins, for that would mean a sinful nature. Then He would not have been the Son of God. When God tested Abrahamas to sacrificing Isaac (mentioned earlier), this test had no appeal to the heart of Abraham. He did not have the remotest desire to slay his son. The command was the sorest trial. But it tested his obedience to God; it tested his faith. By faith Abraham, when he was tested, offered up Isaac (Heb.11:17). So James, speaking of joy when we fall into various trials, says, Knowing that the testing of your faith produces patience (Jas.1:3).Abraham's test did not appeal to his sinful nature, but was a test of whether his natural affection for the child of promise, or obedience and faith would triumph. Were the Lord's temptations by Satan in the wilderness real temptations? God does not tempt with evil; Satan always does. Our Lord's very sinlessness gave Him exquisite sensibilities and the deepest shrinking from receiving temptation from such a one as Satan. He must have suffered intensely in His spirit, as none of us with our sensibilities blunted by sin could ever suffer. Who can say these were not real temptations? Yet there was no sinful nature in our Lord to have a responsive attraction to the evil temptations of Satan. Yet how real were His temptations! The wonderful scene of our Lord's baptism had just taken place. Then we hear the voice of the Father saying, You are My beloved Son, in whom I am well pleased (Mk.1:11) and the Holy Spirit descended on Him like a dove (Mt.3:16)-a wonderful picture of the Holy Trinity in perfect accord as one God regarding our Lord's mission on earth. Then, full of the Holy Spirit, Jesus is led by the Spirit into the wilderness to be tempted of the devil (Mt.4:1). Satan addressed God concerning Job, Have You not made an hedge around him, around his household, and around all that he has on every side (Job 1:10)? When our first parents were tempted by the devil there was nothing in their circumstances to try them. Our Lord's circumstances were far different. Not in the Garden of Eden, but in the wilderness. Not in the ordinary circumstances of life, but having fasted forty days and forty nights (Mt.4:2). There was no Garden of Eden for Him, no hedge about Him. He was exposed to the full blast of Satan's onslaught. The temptation was threefold. First the tempter came and said, If You are the Son of God, command that these stones become bread (Mt.4:3). Our Lord was very hungry after His 40-day fast. Hunger is not sinful. To satisfy hunger with the food God gives us is not sinful. But note the subtlety of the temptation. Satan says in effect, You say you are the Son of God. If so, You have the power to turn these stones into bread. Satisfy your hunger and prove that You are the Son of God.Did not our Lord feel deeply the temptation, even though there was no sinful nature to respond to Satan's suggestion? Surely He did, and His very sinlessness accentuated the trial. How did our Lord reply? As a dependent Man in this world, He used the weapon of Scripture. It is written, Man shall not live by bread alone, but by every word that proceeds from the mouth of God (Dt.8:3). He would not take Himself out of the hands of God to supply His need. The One who supplied the needs of the children of Israel in the wilderness,was sufficient for Him. Satan was defeated in his blasphemous attempt. This temptation by Satan was subtle indeed, seeking to get our Lord to satisfy a natural desire for food when hungry, and in it prove Himself to be what He claimed to be. Not for a moment was our Lord seduced (nor could He have been) from the path of absolute dependence on His Father. Satan's next temptation was still bolder. The devil set our Lord on a pinnacle of the temple. He bid Him to prove that He was the Son of God by casting Himself down, misquoting Scriptures, He shall give His angels charge over You, and in their hands they shall bear You up, lest You dash Your foot against a stone (Mt.4:6).The subtlety of it all! Satan left out the words in his quotation, to keep You in all Your ways (Ps.91:11). The devil was seeking to get the Lord to answer to his (Satan's) ways. The Lord was kept in all His ways-ways of absolute dependence on God. Was this a real temptation to our Lord? Thank God there was no evil within to answer to the temptation with out, but surely His was the deep anguish of having an evil temptation presented to His holy mind by such a one as the devil. Again our Lord foiled the enemy by quoting Scripture, You shall not tempt the LORD your God (Dt.6:16), thus asserting who He was, but refusing to take Himself out of the hand of God. The last temptation was still bolder. Twice repulsed, Satan comes out in his true colors. He has always wanted to be worshiped. He is the prince of the power of the air (Eph.2:2). He took our Lord up on an exceeding high mountain, and showed Him all the kingdoms of the world and their glory. And he said to Him, All these things I will give You if You will fall down and worship me' (Mt.4:8-9). What intolerable repulsion must our Lord have experienced when this temptation was thrust upon Him! What anguish of spirit must have been His, as He allowed Himself to be carried by Satan to the top of this mountain! What a horrible companion for the Son ofGod! What sorrow of heart must have been His as He beheld the outward glory of the kingdoms of this world, well knowing they were sunken deep in their sin of refusing God and His truth, and were available as the gifts of the arch-enemy. Thankfully, the day is not far distant when it will be said, The kingdoms of this world have become the kingdoms of our Lord and of His Christ; and He shall reign forever and ever (Rev.11:15). Our Lord said, Away with you, Satan (Mt.4:10).On this occasion Satan had dared to seek to usurp the place of God. This is intolerable; he is commanded to depart. There can be no tolerance of such an attitude. Again our Lord quotes Deuteronomy, You shall worship the LORD your God, and Him only you shall serve (6:13). Satan was defeated, baffled, cowed! For the first time, Satan met One he could not touch, One who was completely dependent on God, truly the Son of God, triumphant, unassailable! The devil left our Lord and angels came and ministered to Him.What a contrast is the Last Adam to the first! The first Adam in a garden of delights, surrounded by every pleasant creature, despite every mercy, fell. Our Lord, in a wilderness with wild beasts, sore hungry, emerged unscathed and triumphant from the conflict.